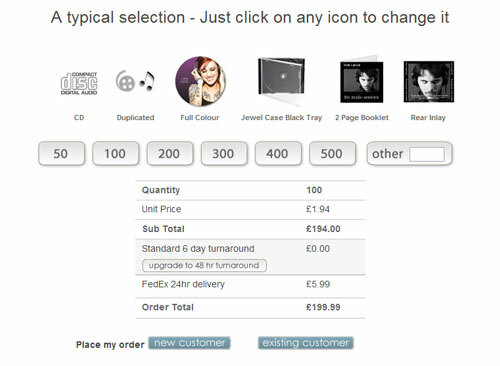 Get instant CD duplication prices with our new interactive DVD and CD pricing tool. No more complicated options, just click and change an option to generate an instant quote. This tool will provide cd duplication prices for quantities up to 500 units. The minimum order is just of 50 units. All come with FREE poly wrap except for plastic wallets and clam shell cases. If you would like to enquire about prices for larger runs please get in touch, as we provide great value fast turnaround replication runs. Standard turnaround time for CD duplication runs is up to 6 working days. We also offer an express option if you need your CD’s in a hurry! The secret behind Discburner’s consistently cheap CD duplication prices is the system behind the scenes. Smart order management means tracking and monitoring orders, artwork and masters is a breeze. Every project is kept on file and ready to go so future runs can be underway in an instant. Our automated duplication and artwork production facilities are second to none. Our duplication machines automatically check every single duplicated disc against the master. This ensures that only 100% accurate copies leave our facility. Our Xerox digital press uses a barcode system to ensure that every fold and crease is perfect. Our CD duplication prices also include poly wrapping at no charge on all hard cases. These include jewel cases, slimline cases and standard DVD cases. We pride ourselves on keeping to our schedule and never dispatch orders late. Whichever packaging option your choose you can be sure that your order will be delivered on time. We are constantly checking our rates against our competition to make sure that we only offer the very best CD duplication prices. If you find the same package at a lower price then do give us a call – we don’t like to be beaten.